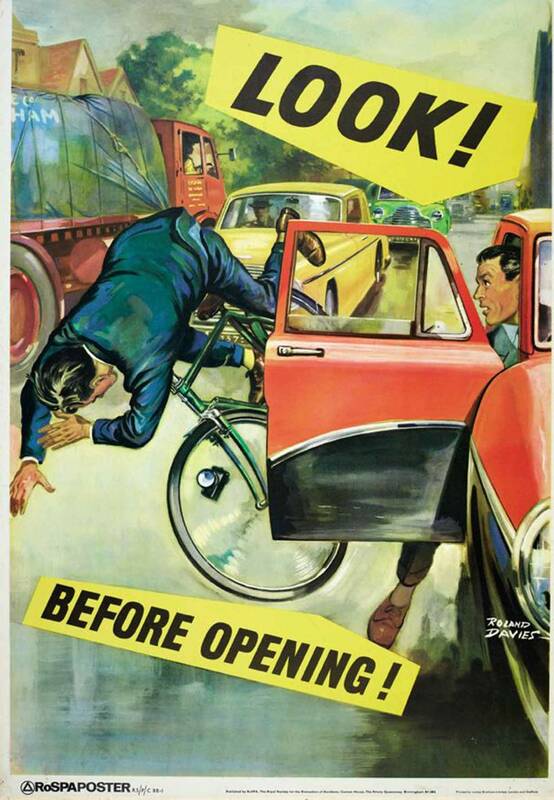 Safety posters from the golden age of accident prevention – Have we lost the art of communication at a cost of countless lives? For Paul Rennie it was, as he puts it, his “Tutankhamun moment”. A lifelong passion for posters had produced a growing personal collection, a shop in Folkestone and – eventually – a career as a graphic design academic at Central St Martins College of Art & Design. 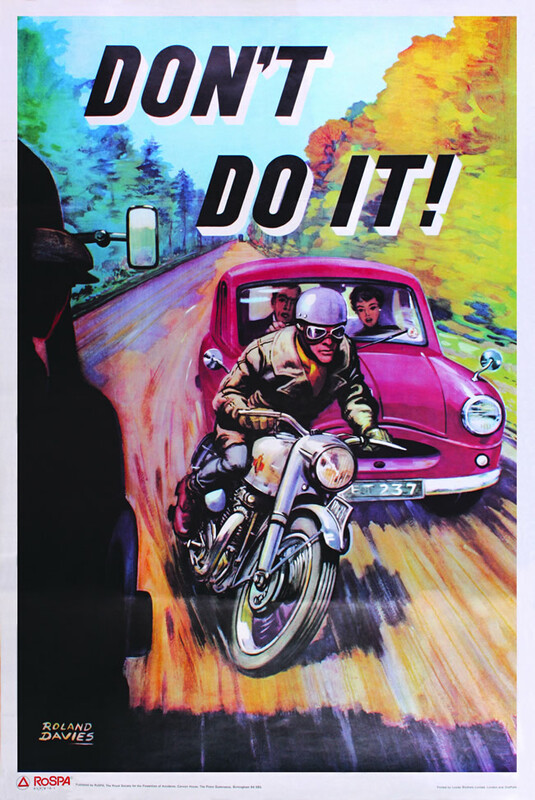 Soon, perhaps inspired by a family tragedy, he embarked on a research project that focused on accident-prevention posters, particularly those dating to the Second World War. But as he began his research, Rennie found large gaps in the archives. There was no tradition of preserving these posters. 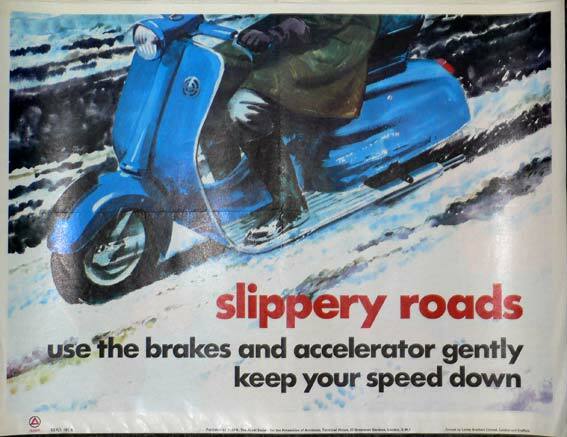 “Then I got a call out of the blue and the caller said, ‘You’ll never guess what, but we’ve discovered the archive in a warehouse that had remained locked for 20 years.’” The posters belonged to RoSPA, the Royal Society for the Prevention of Accidents, which emerged in London in 1916 to tackle a rash of road accidents during wartime blackouts. 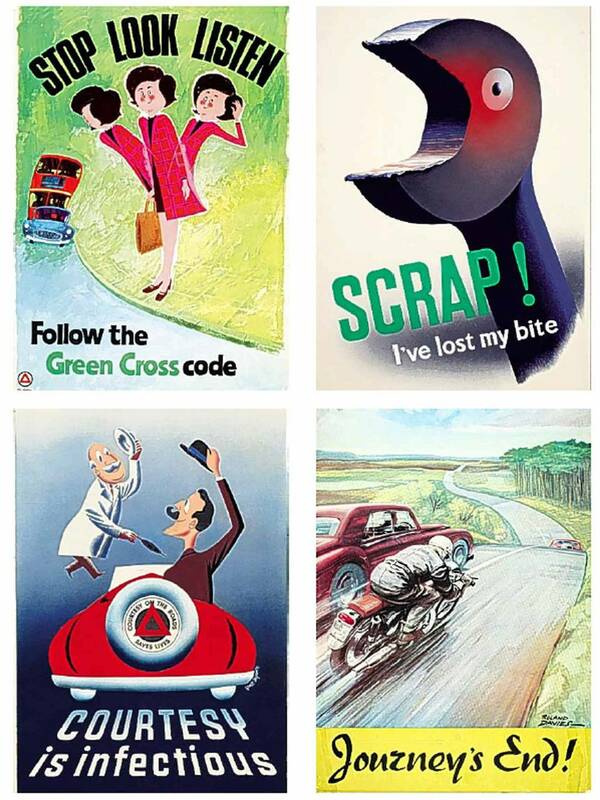 Posters were a part of the charity’s earliest campaigns and, in an increasingly dangerous world, RoSPA soon developed a broader mission to prevent accidents of all kinds. 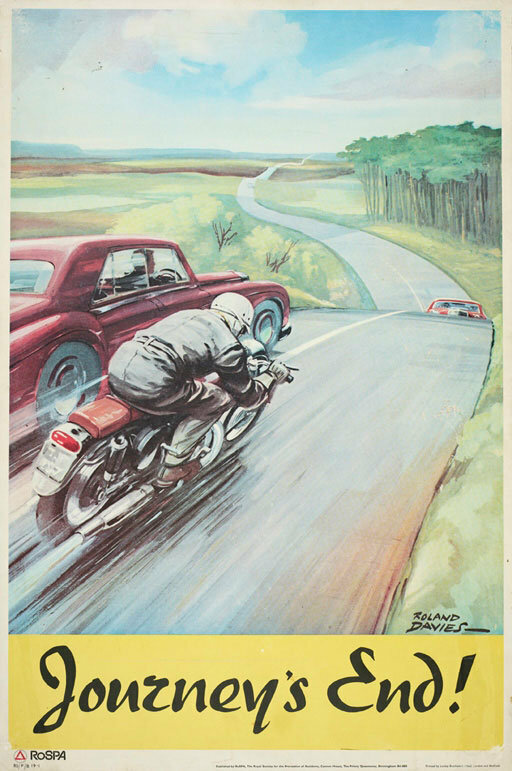 Rennie and RoSPA worked together to publish the lost posters, which date from the 1930s to the 1970s. 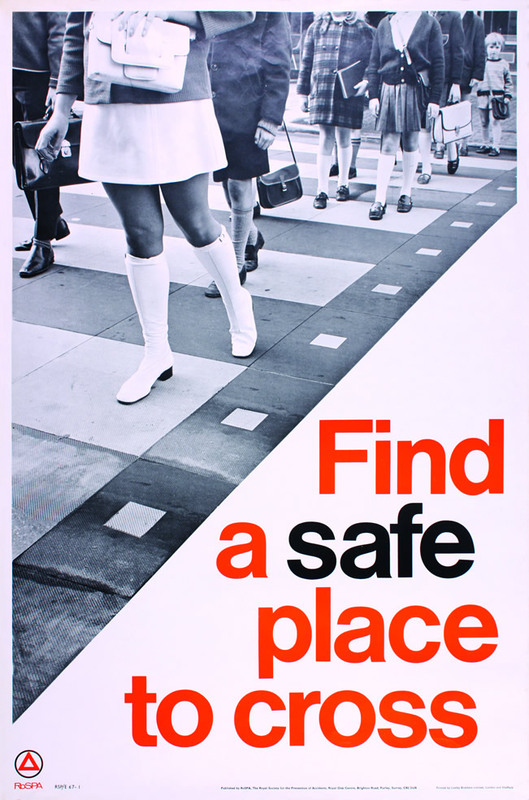 In Safety First, Rennie explores the societal, historical and artistic significance of the sorts of striking and often beautiful posters that were once commonplace on factory floors, police-station noticeboards and billboards. His own favourite is typical. 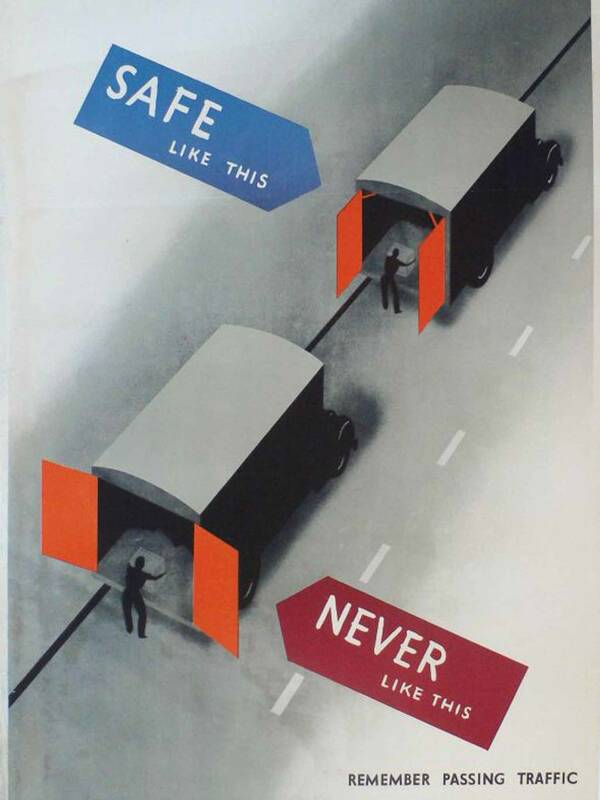 It warns van drivers not to let their rear doors swing into traffic. 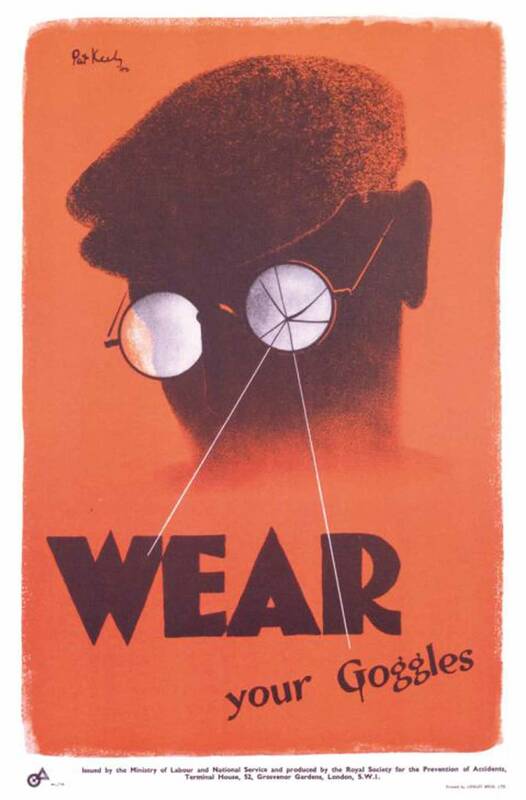 The message could not be simpler yet the poster, which dates to 1946, is also a work of art, inspired by the works of El Lissitzky, a renowned Russian-born artist who blurred the lines between those disciplines with striking, Modernist works of bold, geometric shapes. After the war, a generation of Soviet war propagandists turned their talents to safety in Britain, bringing a new sense of modernity to our streets. “It’s health and safety rendered in Constructivist style, which is just fantastic,” Rennie says. They joined British artists, including Cyril Kenneth Bird, aka the cartoonist Fougasse, most famous for his “Careless Talk Costs Lives” posters. Yet the posters of the era, and through to the 1970s, were more than visually pleasing. What is striking is how many of them convey messages that would trigger howls of “‘elf’n’safety gone mad” today: “Bad weather! Extra care at crossings” and reminders to turn off your iron, bend the knees when lifting things, and flick on your car’s headlights. But since the state gave up responsibility for producing this kind of material, largely handing it over to the makers of television soaps, charities or advertising agencies, Rennie and RoSPA believe that the disappearance of simple yet smart messages have deprived us not only of art but – ultimately – lives, a regression not helped by the popular maligning of health and safety. The UK-wide rollout of smart meters needs to be run by someone outside of government, the company set up to promote the project has said. By 2020 every home should have a digital meter, which communicates directly with energy suppliers and can allow more efficient energy usage. Smart Energy GB said government was “not good” at such projects and warned it it could cost more than the budgeted £11bn without private sector input. The government has rejected the call. The last Labour government announced plans in 2009 for every home in Britain to be installed with smart meters, which the government and energy firms believe could lead to savings of an estimated £17bn. But Smart Energy GB fears that with 1.6 million of the proposed 26 million smart meters currently installed, the timetable could slip and end up costing consumers more than the budgeted £11bn. Baroness Margaret McDonagh, the chairman of Smart Energy GB, said that the installation of smart meters throughout the UK was a giant infrastructure project, and was similar in scope to the building of the HS2 rail line and the Olympic venues. “As we know from experience, governments are not good at big infrastructure projects because it’s not their business,” she said. She is calling for the government to appoint a chief executive from the private sector to run the project. But the Department for Energy and Climate Change (DECC) has rejected the idea. “Last year, an independent review on the smart meters programme backed the current delivery model, which is going to deliver the benefits of smart meters at the lowest possible cost to billpayers,” said a spokesperson for the DECC. It is hoped that smart meters will encourage consumers to be more selective on how they use energy by choosing, for example, to run the washing machine at a time when electricity charges are lower. In the near future this will be even easier as the “internet of things” takes hold. This means new devices will come onto the market which will communicate with the smart meter and switch themselves on and off at the most energy efficient times. But apart from consumers saving money, the biggest winners from the nationwide installation of smart meters will be energy companies themselves. That is because the current analogue systems prevent the efficient distribution of energy to our homes. More electricity is allocated for each home on the off-chance that it will be needed. With smart meters, the power will only come from the grid, the moment it is actually required. But smart meters are expensive and time consuming to install in every single household in Britain. About 6% of the total number of homes have a smart meter already. To achieve the full 100% and meet the Conservative party election promise, a massive ramp up in the installation process will have to start immediately. Screens used to stop motorists peering into crash sites have been deployed just 77 times on busy roads in recent years – despite Highways England spending £2.2m on thousands of the fences. The “incident screens” have only been used 18 times to deter rubberneckers on the UK’s busiest motorways – the M1, M25 and M6 – since April 2013, according to Freedom of Information data. Despite the limited use of the screens to date, more than a quarter of motorists (27 per cent) think the police should always put up screens to block an accident from view, according to polling by insurance company Confused.com. Their survey showed nearly half of Britons think it is only human to be curious when witnessing a road traffic accident, despite the risk of secondary accidents, while one in seven (15 per cent) of drivers have seen another motorist take photos at the scene of a crash. Gloucestershire police said earlier this month it was looking for a dozen drivers who recorded footage of a pile up on the M5 earlier this month that left 18 people were injured, including two people who were airlifted to hospital after a Peugeot was hit from behind and shunted underneath a tanker on the M5. The force said those found to have been rubbernecking could face a variety of charges. In another recent case 20 drivers were stopped by the police in May for filming the scene of a serious accident on the A14 in Cambridgeshire. Those involved could face charges of careless driving which carries a maximum £5,000 fine and up to nine penalty points. Highways England bought 3,000 screens in 2009 in a bid to reduce the £750m it estimated accidents due to rubbernecking cause the economy through secondary low-speed crashes. The screens measure 2 metres by 2.1 metres. It said the average economic benefit of using incident screens is estimated to be around £194,000 per incident. However, the Freedom of Information data revealed the screens have been used 70 times on English roads and seven times in Scotland – including just once on the M8 in Glasgow. Engineers have celebrated laying the three millionth square metre of road surface in Essex. The junction of Church Road and Park Hall Road, Gosfield, was patched up as part of a programme to repair thousands of defects on the county’s highways. Eddie Johnson, Essex county councillor for highways maintenance, said: “This is a fantastic achievement. “This is an incredible 510 miles. That’s approximately the equivalent of driving by car from Chelmsford to Frankfurt. Astronauts currently onboard the International Space Station (ISS) are showing the world just how much light pollution Light-emitting diodes (LED) create (see photo). While many think that this form of lighting is environmentally-friendly given how much energy it saves, it comes with one major problem: it emits a ton of blue light, which sharply increases light pollution. So much so that the difference between LED lighting and normal, old-fashioned high-pressure sodium lights can be seen from outer space. The photo, taken by Italian astronaut, Samantha Cristoforetti, shows the stark difference between center and suburb of the city of Milan, which began transitioning to LEDs in 2012. Before that transition Milan’s lights would have appeared rather uniform and consistent from center to suburbs. Now the center is dramatically brighter. Milan is just one of many cities, including New York, that is transitioning to LED lighting to save power. This doesn’t come without consequences: an increase in blue, green lighting that directly affects our internal clocks and could make it more difficult to sleep. Soon all of the world’s cities may look like the inside of a McDonald’s. A father of two was so annoyed by cars speeding through his village that he built his own mock-up of a speed camera as a deterrent. Police and road safety groups have criticised a father of two for building a fake speed camera outside his house in a bid to slow down passing motorists. Peter Richardson was so fed up with cars speeding past his country home that he set up the bogus device – made from a cardboard box. The 58-year-old said he feared for the safety of his twin six-year-olds James and Ruby after vehicles tore along the 30mph-limit village road at speeds of up to 70mph. He decided to take matters into his own hands by erecting the home-made version outside his £265,000 property in picturesque Knockin, Shropshire. And he claims the dummy device – made from an empty microwave box which he painted yellow, and a disused street light – is working as an effective deterrent. Peter, who owns a pizza restaurant with his wife Lisa, 41, said: “Apparently, someone has to get killed before they put a speed camera up. Someone would die if we did not do this. “The speed drivers travel through is crazy. I get people coming through at an alarming rate. I think people should respect we are a small village. 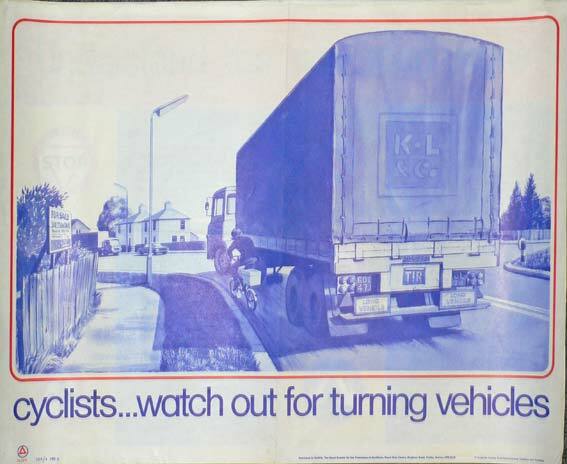 Even some big lorries do 50 to 60mph. “There are lots of families and old people in the village. They are very vulnerable. Just by the nature of being old, they take longer to cross the road. “There have already been pets killed on the road and if we don’t do something ourselves I worry that a child will be next. “People in the village have told me they like the idea. It appears to be working already too, as drivers do notice it and slow down. Residents living in the village have been campaigning for a speed camera to be erected on the B4396 for many years. Ella Evans, 48, welcomed the move and said: “It worked straight away. The drivers seem to spot the box and slow down. But Warwickshire and West Mercia Safer Roads Partnership have said they do not support the use of fake speed cameras. A spokesperson said: “The Safer Roads Partnership does not endorse fake speed cameras and would encourage all of our communities to raise their concerns about speeding through the correct channels, such as through their local parish council or safer neighbourhood team, who will then bring the issue to our attention. A road safety charity also condemned Peter’s decision to “take the law into his own hands”. Rodney Kumar, from The Institute of Advanced Motorists, said: “While we are sympathetic to his plight, we cannot endorse or encourage someone taking the law into his own hands and choosing where to install a speed camera. “The locations of cameras are carefully chosen for safety and effectiveness, and cannot be put in a place purely on a personal choice. However, council bosses have been more sympathetic and said they are happy for the camera to remain in place until they can install an electronic 30mph warning sign. Tim Sneddon, Shropshire Councils environmental maintenance manager, said: “We recognise that there’s a problem with speeding traffic through Knockin and sympathise with residents’ concerns. A spokeswoman for West Mercia Police added they were powerless to remove the camera as erecting it “was not an illegal act”. The 5th edition of the report ‘Utilities Construction Market Report – UK 2015-2019 Analysis’. This report incorporates original input and primary research, and represents an up-to-date and perceptive review of the market and its development. It includes a review of recent market trends and forecasts for the utilities construction market over the next few years. The utilities sector comprises the water, energy and telecoms markets, which were previously operated as state run monopolies but have been opened to private competition for more than 25 years. Construction output for the utilities sector for Great Britain in 2014 was around £7.9bn and has experienced growth of 64% since 2008, outperforming the wider infrastructure market over the last 2-3 years due to outstanding growth in the electricity sector. Construction output in the electricity sector more than quadrupled 2008-14, and this accounts for the overall improvement in sector performance over the period. The chart indicates that utilities construction output grew by 49% 2009-11 but only by 10% 2011-14 when growth in the electricity sector was partly offset by declines in the water and sewerage sectors. The level of capital spending within the utilities sector is underpinned particularly through 5 year asset management and renewals programmes for individual sub-sectors such as water and electricity. DUBLIN–(BUSINESS WIRE)–Research and Markets (http://www.researchandmarkets.com/research/gczwr7/utilities) has announced the addition of the “Utilities Construction Market Report – UK 2015-2019 Analysis” report to their offering. Electric vehicles (EVs) have a lot going for them, but long charging times are still a barrier to adoption for many consumers. This is understandable—society has been conditioned for the last 100 years to think of a car as something that you can refuel in a few minutes. Even the fastest DC fast chargers still take almost half an hour to recharge an EV. What’s more, the laws of physics get involved at some point, limiting the rate at which you can charge a battery before things start to get messy. The answer to impatient drivers needing a recharge may well be special roads that can power up a car on the move, F-Zero style. This week, the UK government announced that it wants to begin testing this tech, and soon. Inductive charging makes the jump from consumer tech to electronic cars. Wireless recharging isn’t that outlandish a concept, as anyone with an electric toothbrush may well know. Plenty of smartphones also use wireless charging, and we’ve covered Qualcomm’s Halo tech that the company has been demonstrating with a BMW i8 hybrid that travels with theFIA Formula E Championship. The Halo system is designed to charge a car when it’s stationary, but Qualcomm’s Graeme Davison told us that it should be adaptable to low-speed recharging relatively easily. This week Police launched a week of action against speeding drivers. Officers are targeting areas of the city and in towns and villages across the city and county. The campaign is part of a concerted campaign by police forces across Europe. Leicestershire Police said it would send its mobile speed camera vans to locations it has identified as speeding hotspots or those where residents have previously raised concerns. The force said the risk of death was approximately four times higher when a pedestrian is hit at 40mph compared to 30mph. The Leicestershire and Rutland Road Safety Partnership runs regular speed awareness campaigns. Chief Inspector Steve Potter said: “Despite the best efforts of the Leicester, Leicestershire and Rutland Road Safety Partnership many drivers are still failing to heed the advice to keep to the posted speed limit and to drive to the prevailing road conditions, thereby putting themselves and others at risk of injury. Earlier this year, the Leicester Mercury reported that Leicestershire’s network of fixed and mobile speed cameras caught more than 50,000 offenders in 2014. The busiest camera was the one which overlooks the Catthorpe interchange, where the M1 meets the M6 and the A14. That camera, which clocked a vehicle travelling at 119mph, caught more than 12,000 speeders between its installation in May and December last year. The second most active camera was the one on the A50 at Field Head, near Markfield. The camera, a mobile unit which can be moved to different locations, caught 2,324 speeding motorists in 2014. The speed limit there was reduced from 50mph to 40mph last year. Many speed camera activations resulted in the culprits going to driver education workshops or being sent to court. The penalty for low-level speeding was increased from £60 to £100 last year. Photos of children whose mums and dads are working on the motorway are being used on signs behind the safety barriers to remind workers of the importance of safety, and motorists are also being urged to think about the people behind the cones when they drive through the roadworks. Nearly 300 people are currently working on a 17-mile stretch of motorway between junction 8 of the M60 near Sale and junction 20 of the M62 near Rochdale, as part of a Highways England scheme to tackle congestion and improve journey times. New technology is being installed to monitor traffic levels and variable speed limits will be used to improve the flow of vehicles when the project is finished. The hard shoulder is also being permanently converted into an extra lane between junctions 18 and 20 of the M62, increasing capacity between the north west and Yorkshire. Narrow lanes and a temporary 50mph speed limit are currently in place along the route for the safety of workers and drivers, and so far over half a million hours of work have been carried out without any injuries. The new signs feature 3 children whose parents work on the motorway, warning ‘My mummy works here’ or ‘My daddy works here’ alongside the message ‘Take care within the roadworks’. “Joseph describes my job as building a motorway so he was really excited to have his photo taken for the safety campaign. We’ll have to see what he makes of it when he sees his face on a sign at the side of the road. I hope the campaign will encourage people to think more about the workers behind the barriers, as well as reminding us to remain focused on safety while we’re on the motorway. “This is one of the biggest construction projects currently taking place in the region so it’s vital we do all we can to make sure both workers and drivers stay safe. Paul is one of the hundreds of workers involved in the scheme whose friends and family want to see them come home safely every day. When the smart motorway scheme is completed in autumn 2017, around 200 new electronic message signs on overhead gantries will warn drivers of changes in the mandatory speed limit, lane closures and incidents ahead.